If you’re thinking about renovating your home with new siding, windows, doors, or gutters, it’s important to ensure that you hire the right team for the job. At Blue Springs Siding and Windows, we understand the importance of delivering quality services and products to our customers, and that’s why we purchase the best products and hire the most talented technicians we can find. We guarantee all of our products and services – whether you hire us for a window installation or a door replacement, Blue Springs Siding and Windows will cover the services and products for life. Blue Springs Siding and Windows is proud to provide Overland Park and the surrounding areas with a wide range of home renovation services. We offer window installations, door installations, siding installations and replacements, sunroom installations, and roofing and gutter services at rates that can’t be beat. Call Blue Springs Siding and Windows’ friendly team at 816-629-6270 today or reach out to us through our website to get started! Which Window Is Right for Your Home? Whether you’re considering purchasing replacement windows or adding new ones to your home as part of a remodel, it’s important that you select the right ones for your home. Blue Springs Siding and Windows has the team and information you need to make the process streamlined, efficient, and hassle-free. Our window contractors are the best that you’ll find in the Overland Park area, so don’t hesitate to reach out to them if you’re looking for more information about a window installation for your home! Double-hung windows are the most popular windows we install, and it’s easy to understand why. Double-hung windows can open from the top or the bottom, making them extremely easy to clean and open. Their versatility and ease of maintenance makes them a smart choice for anyone looking for cost-efficient and low-maintenance replacement windows. At Blue Springs Siding and Windows, we use Soft-Lite windows in our double-hung window installations because of the brand’s commitment to quality and consistency. If you’re looking for a way to frame the beautiful scenery around your home, a picture window installation is exactly what you need. Picture windows are large frames that provide you with an unobstructed view of the areas around your home. Maybe you enjoy looking out at your garden each morning as you sip your coffee, or perhaps you have a beautiful view of the sunset each evening. Regardless of where your home is located, you’ll be impressed with the amount of natural light that picture windows provide. Picture window installations are a fantastic way to lower your lighting costs, and you may even find that you don’t have to heat your home as much in the winter due to the added sunlight. At Blue Springs Siding and Windows, all of our picture window installations are performed using Soft-Lite windows. We’re committed to providing our customers with the absolute best products and services in the Overland Park area, and Soft-Lite windows are the best in the industry. If you’re curious about what picture windows would look like in your home, just get in touch with our window contractors or stop by our showroom in Blue Springs for more information! 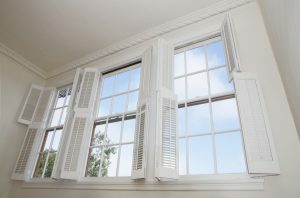 Casement windows open and close using a crank, and this has led to them being commonly referred to as “crank windows.” Casement windows come in two different forms: traditional casement windows and awning windows. The former swing open either to the left or to the right, while the latter swing up or down. 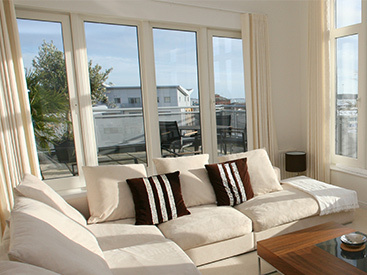 Whichever model of casement windows your choose for your home, you’ll love the views and ventilation they provide. If you’re not sure about which casement window model would be the best for your home, just stop by our showroom in Blue Springs or give our window contractors a call. We offer free estimates, and we’d love to help you find the perfect replacement windows for your Overland Park home. 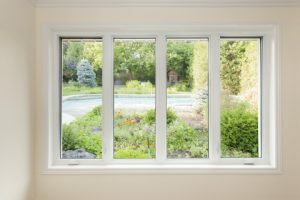 We use Soft-Lite windows for all of our casement window installations, so no matter which model you choose, you can rest assured that you’re purchasing top-of-the-line windows. If you’re looking for a replacement window that will create an open and inviting atmosphere in your home, a bow and bay window installation might be exactly what you need. Bow windows typically use at least three windows joined in a way that forms sharp angles, while bay windows have at least four windows that are joined together to form a more gradual curve. Whichever model you choose, bow and bay windows will make your home look bigger and more inviting. You may even discover that they create a new focal point in your home that draws the attention of your guests. Each of our bow and bay window installations is performed using Soft-Lite windows, the highest-quality replacement windows the industry has to offer. We’d love to help you find the perfect bow and bay windows for your home – call us at 816-629-6270 or get in touch with us through our website to get started on your next replacement window project! Your home’s siding provides you with protection from insects, the elements, and it also contributes to your home’s efficiency. As such, it’s important to ensure that you’ve outfitted your home with siding that will last you for decades. Blue Springs Siding and Windows is proud to guarantee each of our siding installations and materials for life. Are you ready to equip your home with the best siding in Overland Park? Contact our siding contractors at 816-629-6270 or use our online contact form to get in touch with us! Your home’s siding provides you with insulation and protection from the elements, and it can be customized to match virtually any aesthetic preference. No matter which siding option you choose for your home, Blue Springs Siding and Windows is committed to providing the Overland Park area with top-notch materials and siding installation services. We over all of our siding materials and labor with a lifetime warranty for your peace of mind. If you’re interested in learning more about our home siding options, get in touch with us at 816-629-6270 or email us through our website to request more information. 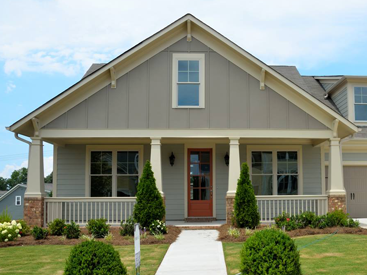 We offer free estimates, so don’t wait to get the home siding you deserve! Vinyl siding first became a popular choice for homeowners in the United States in the 1960s, and it has remained one of the most popular home siding choices available due to its affordability and durability. Recent developments in the siding industry have made vinyl siding even more durable and weather-resistant, making it the perfect home siding option for homes in the Overland Park area. In addition to improving your home’s curb appeal, vinyl siding will make it easier to maintain your home’s temperature throughout the year. If your current siding is old or worn, you may even find that new siding lowers your monthly heating and cooling costs. Fire Resistance: James Hardie siding is approved for fire-rated construction, and its fire-resistant properties will provide you with additional peace of mind. Pest Resistance: You’ll never have to be concerned about termites, wasps, or other insects taking up residence in the side of your home when you choose James Hardie siding. Time Resistance: You’ve more than likely seen a home in the Overland Park area with siding that’s shoddy and faded due to years of exposure to the elements. James Hardie siding is built to retain its looks for much longer than the other siding options on today’s markets, and you’ll never have to worry about it chipping or cracking over time. Blue Springs Siding and Windows makes it easy and affordable to get the door installation or replacement you need for your Overland Park home. Whether you’re looking for a beautiful set of French doors for your office, or a sliding door that will brighten up your dining room, we’ll help you choose the door that meets your needs and your budget. Each of our doors is held to rigorous quality-control standards, and we provide a lifetime guarantee on all of our parts and labor. If you’re not sure about where to start when it comes to finding a new door for your home, just reach out to us! You can reach us at 816-629-6270 or by email. We offer free estimates, so don’t wait to get started on a door installation for your home! 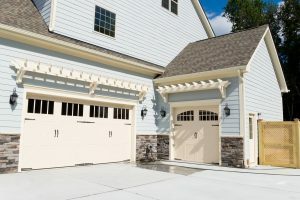 Which Door is Right for Your Overland Park Home? Your home’s entry door makes a statement about your home. Blue Springs Siding and Windows is proud to provide Overland Park residents with entry door installations that will impress anyone who enters your home. As part of our commitment to providing our customers with industry-leading products, we’ve chosen to use Pro-Via products for all of our entry door installations. Pro-Via doors are manufactured using a fiberglass wood-simulating material that delivers the aesthetic qualities of wood without the negative aspects of traditional wooden doors. 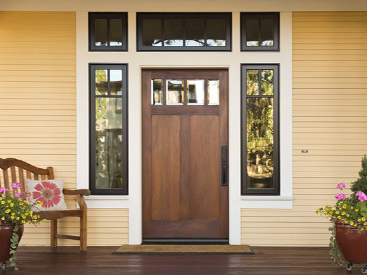 Traditional wooden doors are vulnerable to cracking, staining, and warping, but Pro-Via’s entry doors will remain strong and sturdy for years to come. Storm doors are a popular addition to homes around the United States for a number of reasons. In addition to providing homes with an added layer of security, they can also act as a window that fills the home with natural light. The Overland Park weather can be severe at times, and a storm door installation can protect your entry door from being damaged by rain, hail, snow, and the sun. Our storm doors are available in a wide range of colors and styles. Our customization options allow you to choose every aspect of your door, including the glass, grille, and screen. Homeowners around America are using their patios more and more. Whether you enjoy entertaining, throwing family barbecues, or reading quietly outside, it’s important to make sure that every aspect of your patio is welcoming and aesthetically appealing, including the door that leads there. Blue Springs Siding and Windows proudly carries a wide variety of patio door options, including patio doors from two industry leaders, Soft-Lite and Pro-Via. We carry patio door options that include hinged, swinging, and sliding patio doors. If you’re not sure about which patio door is right for your home, just stop by our showroom in Blue Springs or contact us for more information! 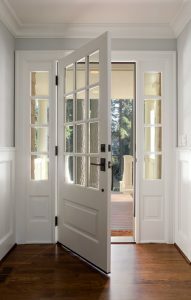 French doors are one of the best ways to add a touch of elegance and sophistication to your home. French doors can be installed in nearly any room of the home, and they can be tailored to match any aesthetic guidelines you have for your home. Transparent Glass: Great for filling a room with natural light. Translucent: Perfect for added privacy and reduced lightflow. Tinted: Tinted glass limits the amount of light that will enter through your door and provides even more privacy than the previous two glass options. Textured: Textured glass is the optimal way of adding even more elegance and charm to your French door. Not sure which French door is right for your Overland Park home? Come by our Blue Springs showroom or call us at 816-629-6270 for more information! Sliding doors have become more popular in recent years due to design improvements that eliminated many of the problems that plagued older sliding doors. Older models frequently became difficult to open and noisy in a short period of time, but the sliding doors on today’s market will remain easy to open from the day they’re installed. At Blue Springs Siding and Windows, we like to think about sliding doors as gorgeous moving windows, and we know that you’ll love the natural light that a sliding door fills your home with. Moreover, sliding doors allow you to utilize all of the space in your home — say goodbye to the days of planning a room around the path of the door! Contact us at 816-629-6270 to learn more about our Kansas City sliding door installations. Full-Glass Capabilities: Crown Windows & Sunrooms’ windows extend from the ground to the ceiling, which maximizes the amount of light that fills your sunroom. Customization: The unique materials Crown Windows & Sunrooms uses allow for your sunroom to be customized to match your home’s exterior. Your friends and neighbors will never know the sunroom is a new addition to your home! If you’re wondering where to begin when it comes to sunroom installations in Overland Park, stop by our showroom or call us at 816-629-6270! We offer free estimates, and our friendly team will be more than happy to provide you with the information you need to know in order to make an informed decision. Your home’s roof is one of your biggest assets. 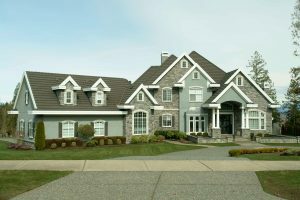 It provides you with protection from the cold winters and hot summers in Overland Park, and an efficient roof will also keep your heating and cooling costs low. Blue Springs Siding and Windows is a leader in residential roofing, and we’ve provided quality roof replacements in the Overland Park area for more than 15 years. We selectively purchase only the best roofing materials in the industry, and we provide our customers with a guarantee on all of our parts and labor. Our roof contractors stay current on the latest roofing techniques and technologies in order to provide our customers with the best roofing services possible. If you’re thinking about a roof installation or roof replacement for your Overland Park home, get in touch with Blue Springs Siding and Windows today to get started! We offer free, no-obligation assessments, and we’d love to help you find the perfect roofing option for your home. Contact our roofing experts at 816-629-6270 or reach out to us online through our website! Let Us Handle Your Gutters! If you’re like most homeowners in America, the last thing you want to do with your weekend is clear debris from your gutters. At Blue Springs Siding and Windows, we know how labor-intensive cleaning your gutters can be, and that’s why our gutter services are designed to help you make gutter maintenance as easy as possible! It’s easy to put off cleaning your gutters until you’re faced with packed, overflowing gutters that are beginning to hang lower than they should. However, gutter maintenance should be one of your top priorities when it comes to home maintenance. Gutters direct water away from your home, keeping your roof, foundation, and landscape protected from water damage. Pine needles, leaves, and other forms of debris can easily build up in your gutters, making it difficult for them to efficiently transport water away from your home. Stagnant water and large amounts of organic matter in your gutters can become a breeding ground for insects, worms, and plants—the last thing you want is a compost bin on your roof! Blue Springs Siding and Windows’ Gutter Defender product makes gutter maintenance easier than ever. Gutter Defender’s patented nose-forward design extends past the lip of your gutter, directing debris away from the openings in your gutter. Rainwater can efficiently flow across this cover and into your gutter without carrying extra baggage. With Gutter Defender, you’ll never have to deal with a clogged gutter and will have more time on the weekends to spend with your friends and family. We offer a lifetime warranty for all of our gutter services and labor. If you’re curious about learning more about our Gutter Defender system, call us at 816-629-6270 or get in touch with our gutter experts through our website! We offer free estimates, and we’d love to help you make gutter maintenance as easy as possible. We also offer installment loans, revolving lines of credit, and special offers like 90-day deferments. All of Blue Springs Siding and Windows’ financing options are contingent upon credit approval. If you’d like to learn more about our flexible financing options, get in touch with us at 816-629-6270 or contact us through our website. Blue Springs Siding and Windows is proud to be Overland Park’s go-to provider of replacement windows, home siding options, and a wide range of other home renovation services. We use the most efficient and effective products in the industry, and we stand behind our products and our team with lifetime guarantees. Visit our showroom in Blue Springs to view our huge selection of window, door, siding, and sunroom options. We look forward to helping you turn your dreams into a reality!